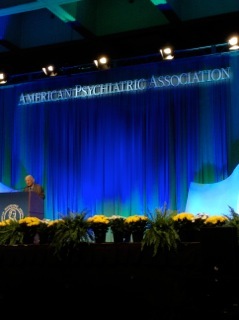 As posted previously, last month I attended the American Psychiatric Association’s (APA’s) annual conference. Straying from my usual format, I thought I’d post pictures from the meeting and, of course, offer comments. 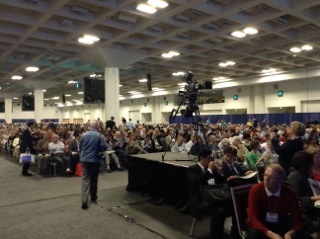 The meeting took place in Moscone Center, a conference center complex located just south of Market Street in downtown San Francisco. 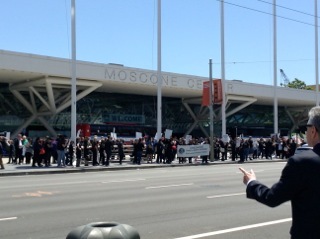 Depicted here are anti-psychiatry protesters who held a rally in front of the main entrance at noon on the first day. There was also an exhibit of psychiatry’s cruelties (psychosurgery, shock treatment, inhumane conditions in asylums, etc) running all five days in a tent across the street from the conference. The same huge auditorium was to hold the keynote address by Bill Clinton. However, Mr. Clinton was ill and could not be there in person. Several hundred (a couple thousand?) conference-goers nonetheless waited over an hour to see him on video. Mr. Clinton was pleasant, thoughtful, and charismatic, but didn’t offer much specifically about psychiatry or mental health. Mostly he spoke about public health needs in general. I didn’t take many photos in the talks themselves. Officially it was forbidden, although this rule was routinely ignored by attendees. The quality of the presentations was high — I mostly chose “mainstream” ones this time, not the many off-beat and generally smaller meetings. I attended presentations on suicide, personality disorders, PTSD, sexual compulsions, DSM-5 and mood disorders, the controversy over antidepressant efficacy, psychiatrists writing and blogging for the general public, teaching psychotherapy to residents, and assessing the capacity of demented patients to make medical decisions for themselves. 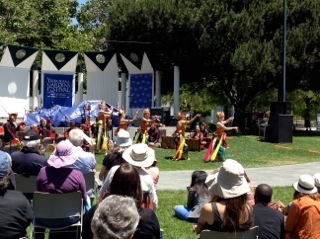 There were dozens of others I would have liked to attend, had they not coincided with the ones I chose. The DSM-5 itself is $200 in hardcover, $150 in paperback — an unabashed moneymaker for the APA. Despite the incredible controversy it stirred up, my impression is that the changes from DSM-IV-TR are relatively minor. In particular, the personality disorder section hasn’t changed much, although the new edition is no longer multi-axial, i.e., there is no “Axis 2”. Some language has been made more precise, as well as more “biological” in some passages, and some disorders have been expanded to include more that would previously have been considered normal. Whether this is good or bad depends on one’s perspective in several respects; mostly I find it unfortunate. DSM classifications often matter more to insurers and disability officers than to practicing psychiatrists, who in David Brooks’ words are “heroes of uncertainty” (echoing an earlier post of mine, but I’ll forgive him for not quoting me). We deal with individuals, not disease categories. I will end with a slide from the talk on antidepressant efficacy that summarizes this tension in my field. As I’ve discussed previously, randomized controlled trials (RCTs) are the gold standard for scientific rigor in psychiatry; however, a lot of psychiatry is not scientific in this sense. DSM categories help define the “average” patient with a particular disorder, leaving a lot of wiggle room since the categories are not based on etiology. 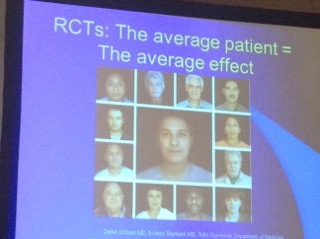 RCTs say which treatments best help this “average” patient, represented by the computer composite in the center of this slide. However, I don’t see “average” patients, I see one of the 12 individuals who contributed to the composite. 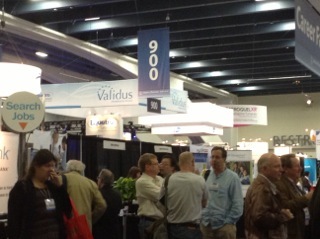 Thus, for me, the new DSM was a sideshow at the conference. The most insightful presentations, whether on PTSD, suicide, or capacity assessment, combined science and the nuanced human communication of meaning. They recognized that our work is informed by science but goes well beyond it. Anti-psychiatrists don’t like this, insurers don’t like this, neuroscientists don’t like this, even many psychiatrists don’t like this. But it’s true and inevitable for the foreseeable future. I like it. As for the APA annual meeting, I’m glad I went, and equally glad I won’t feel the need to go back for several years at least.